Hello! 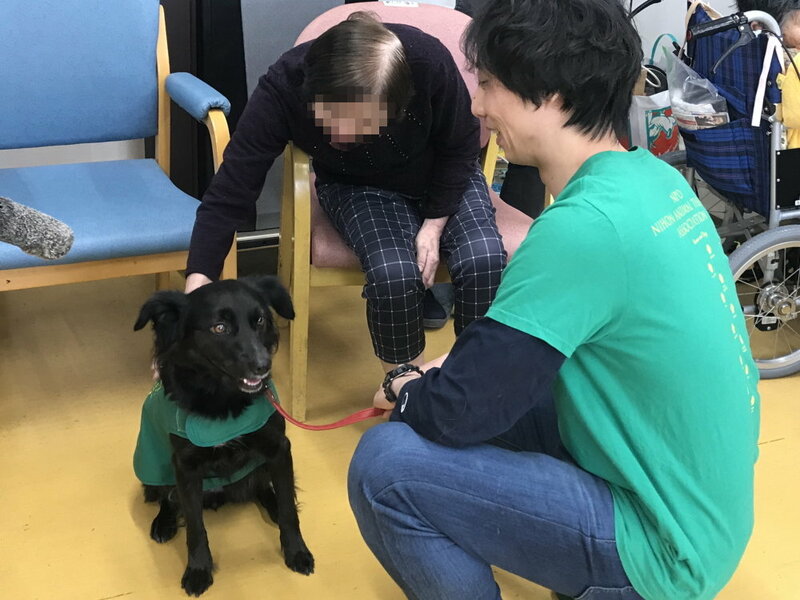 Thank you for always providing us warm support for JATA’s “ Stray Dogs become therapy dogs “ project.This time we will give a report of a Therapy Dog named Chocolat ( Mixed Dog). 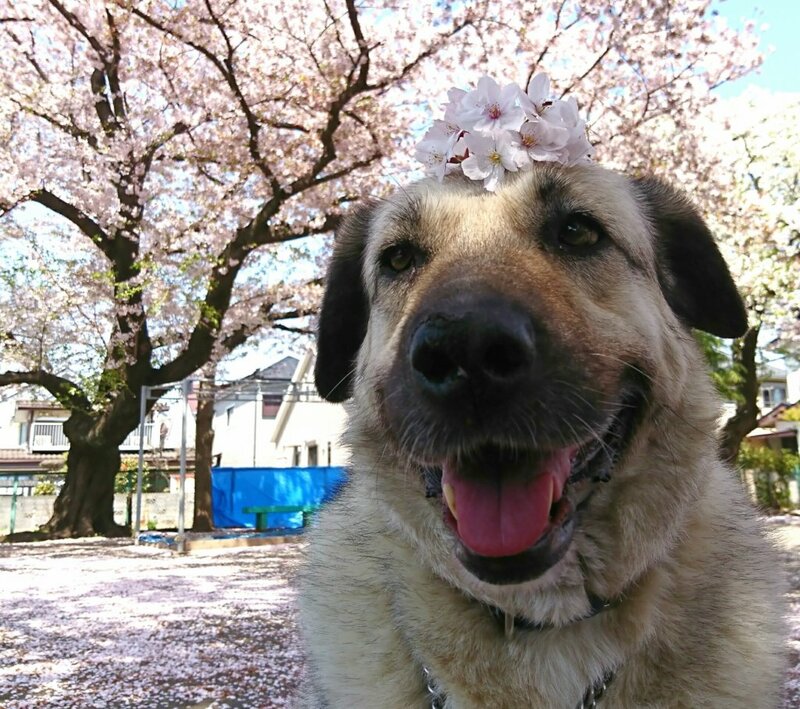 As we mentioned before, Chocolat was a stray dog in Turkey until she was rescued and came to Japan two years ago.Chocolat had faced plenty of difficulties until she was rescued. However, after she came to Japan she was protected and she received lots of love from many people. 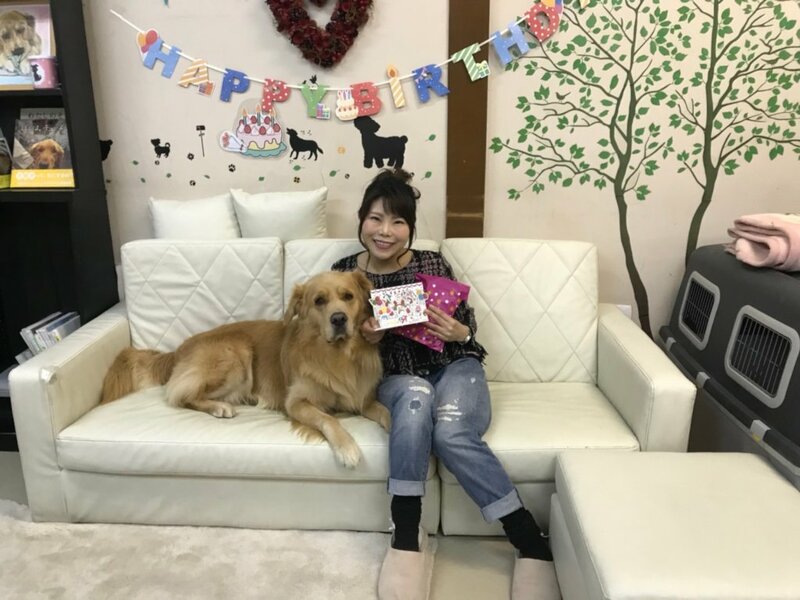 Now she is a popular therapy dog in “Healing & Recreation Salon for Human and Dogs” (http://ikoi.me/). This is where people can interact with different therapy dogs. 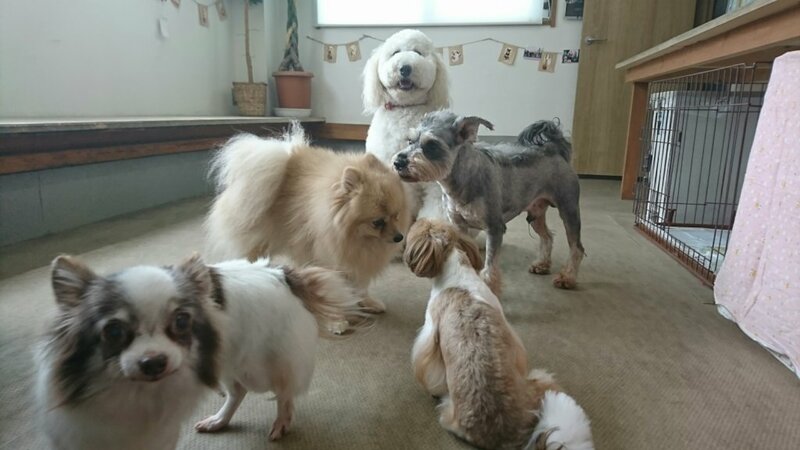 A variety of people come to this salon every day; people who like dogs, those who want to spend a relaxing time with dogs, those who want to heal their mental or physical fatigue,those who are suffering from pet loss and have mental illness, and those who want to enjoy the time with their family or friends, are few examples. Each person has their main purpose to visit the salon. 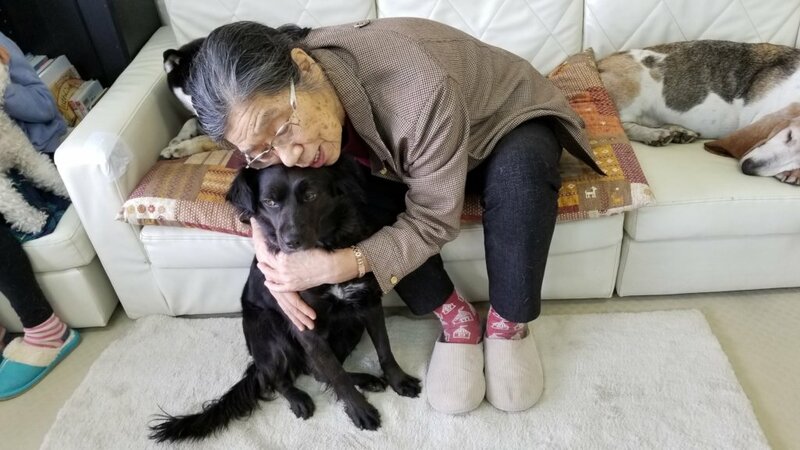 Therefore, the therapist and therapy dogs need to act and respond according to their needs.Chocolat does not act according to the order of the therapist, but instead she judges herself and acts with her own decision as she carefully observes the person that needs her. Chocolat is never shy when she meets a new person. She is always welcoming with a smile. People who suffer from serious mental illnesses also visit the salon. Chocolat gets close to them and comprehends their feelings.People who have human relationship or job problems and who are mentally unstable or depressed also visit the salon. At the beginning they have no facial expressions, but as they touch and interact with Chocolat, who accepts everybody no matter who, they feel “I am welcomed! She remembers me!” and they express their joy. That experience leads to their self-confidence, and many become frequent visitors of the salon. As a result, they regain their joy of living. 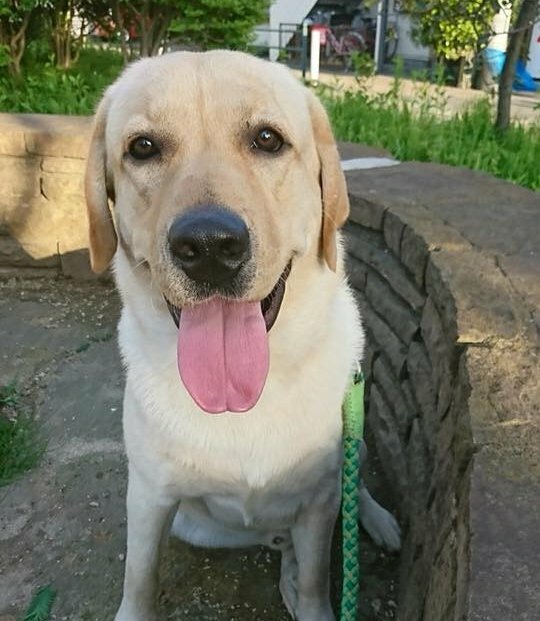 We have seen many people recover their mental and physical health, that did not improve by the hospital treatments or medicines, by the endless healing power of dogs. 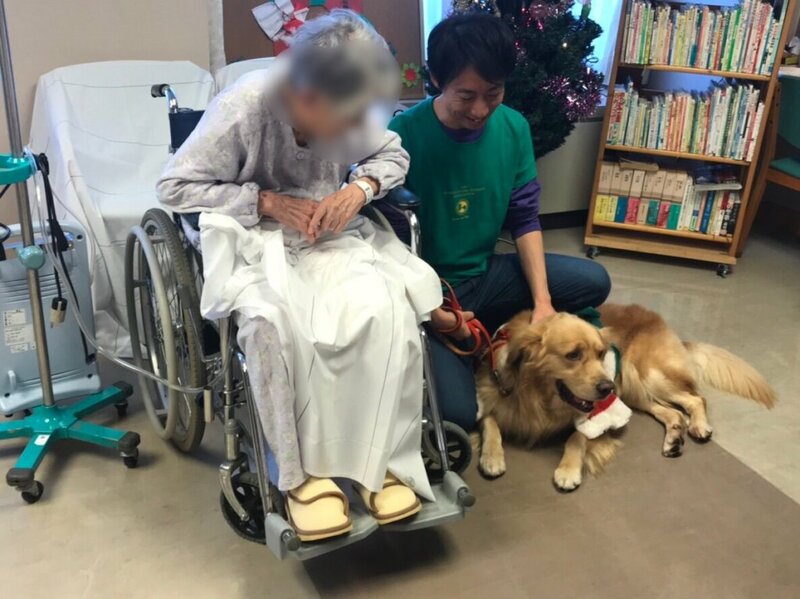 The other day, Chocolat was introduced as a “working dog” in a reputed animal program of NHK TV(Japanese public broadcasting station).In Japan, the animal therapy has been notably picked up in the media in recent years and though its awareness is gradually increasing, it is currently not popular yet. 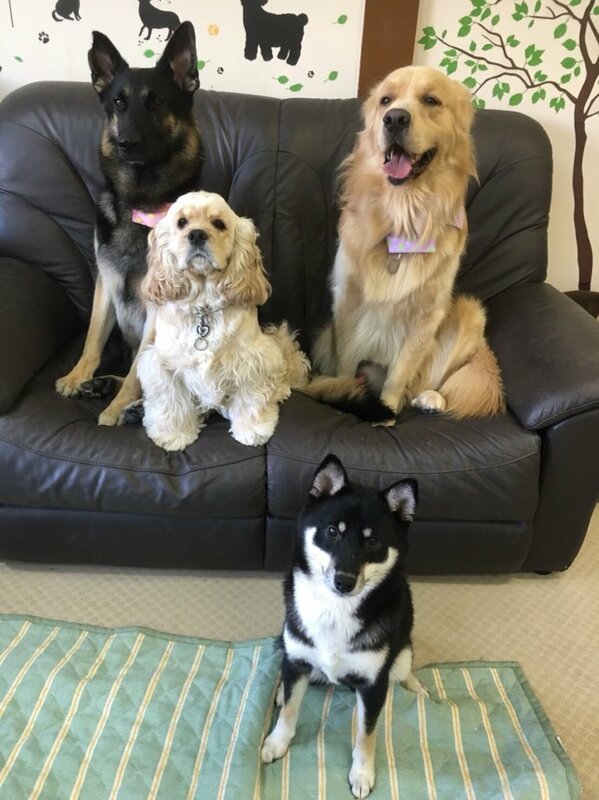 To know the activities of the therapy dog via mass-media is an occasion to become familiar and understand clearly what Animal Therapy is.We believe that if many people understand the possibility of the infinite healing power of a dog has, it will widespread the name of therapy dogs. Thank you for your warm support for JATA 's "Stray Dogs become Therapy Dogs“project. 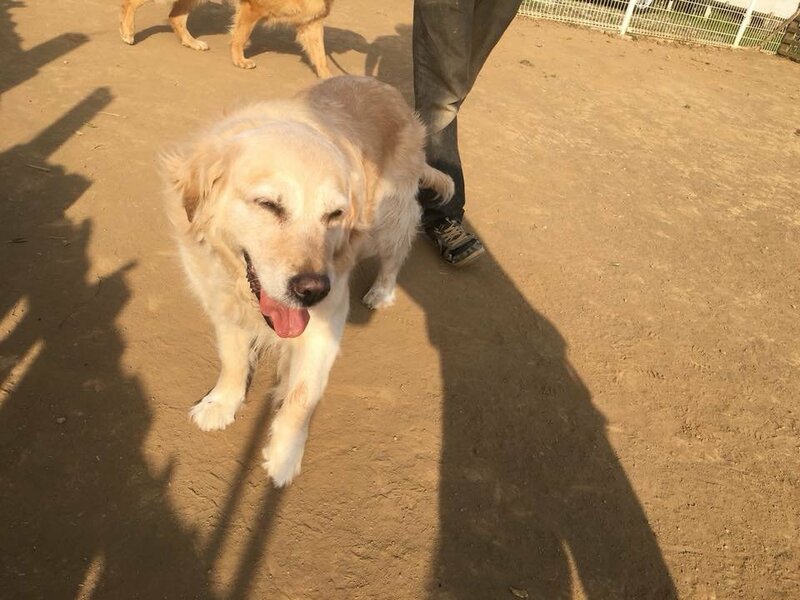 This time we will report on the recent status of Johann, a Golden Retriever who was a wild dog in Turkey until three years ago. Johann always works as a therapy dog at the “Healing & Recreation Center for Human and Dogs," (http://ikoi.me/) a salon where you can interact with the therapy dogs. 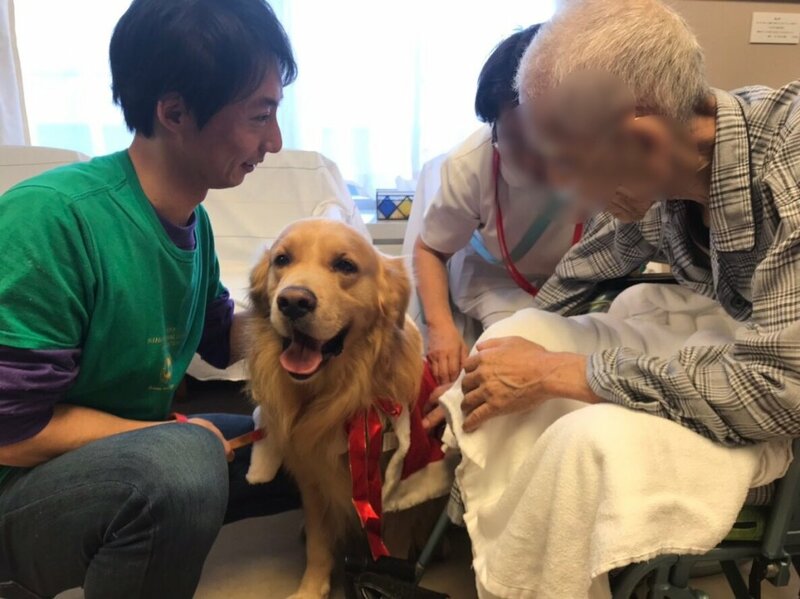 On November 30th, we went to the Palliative Care municipal hospital in Fukuyama(Hiroshima prefecture) for an animal therapy visit.Visit to a hospital of palliative care was the first experience for Johann.We received a great welcome from doctors and nurses there. 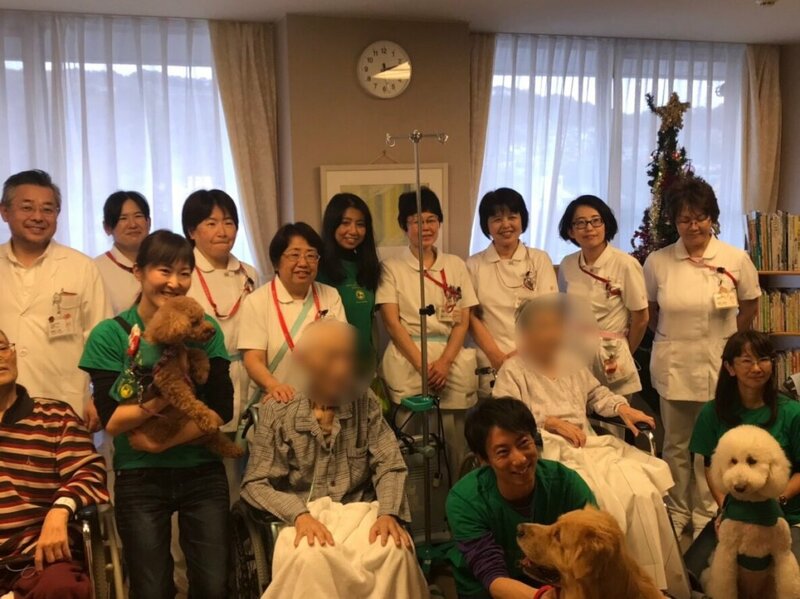 In Japan, considering the risk of infections and accidents by animals, it is still difficult to put dogs in hospitals. 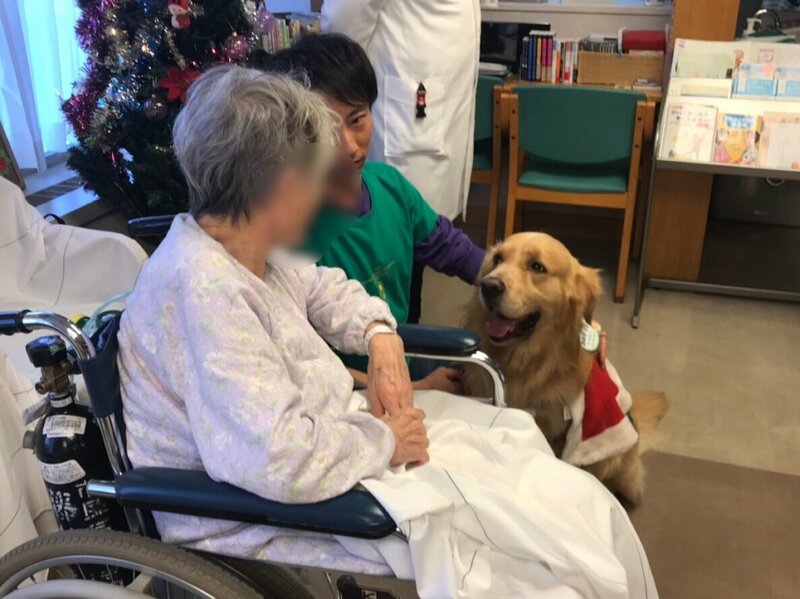 Therefore, animal therapy in hospitals does not spread easily.However, at this hospital in Fukuyama, we hoped to give the patients of terminal care a peaceful time and decided to introduce this animal therapy. Four patients received animal therapy this time.Johann was calm even at a place he came for the first time, following the directions of the animal therapist, and was cable to safely interact with the patients.The patients showed gentle smiles and we received such words as "I don’t feel much pain now". Doctors and nurses also said, "We always see the patients looking painful, so being able to see the patients’ smile made us very happy. 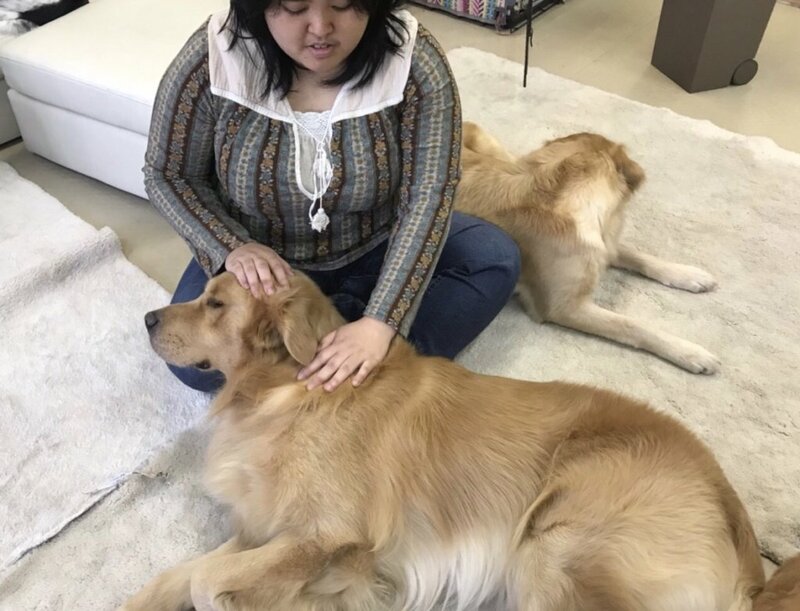 We were able to again experience the power of the animal therapy. 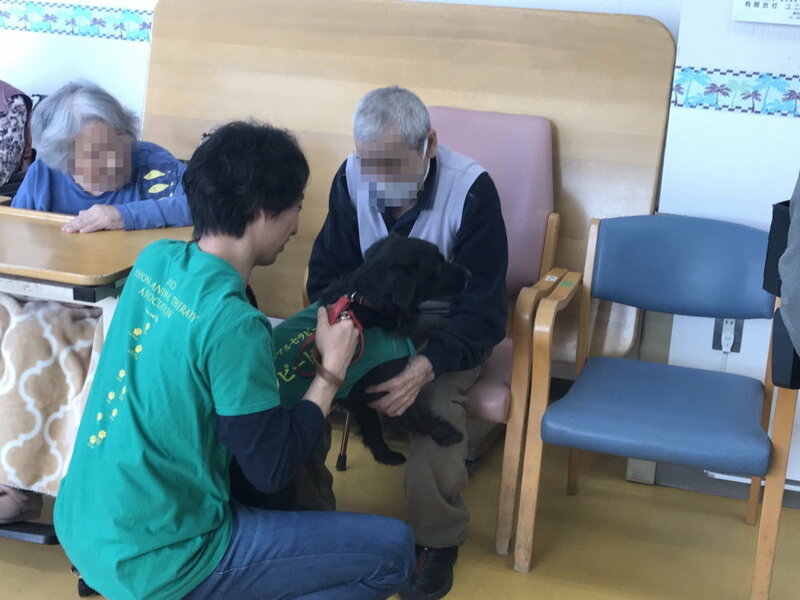 Johann celebrated his 5th birthday in December (Estimated age for wild dogs) at the "Healing & Recreation Center for Human and Dogs".Many people came to celebrate him.Johann, once a wild dog, has received plenty of affection and became to trust people. Now, as if in return, he gives courage and hope to those who have heart diseases or are in need of warmth. 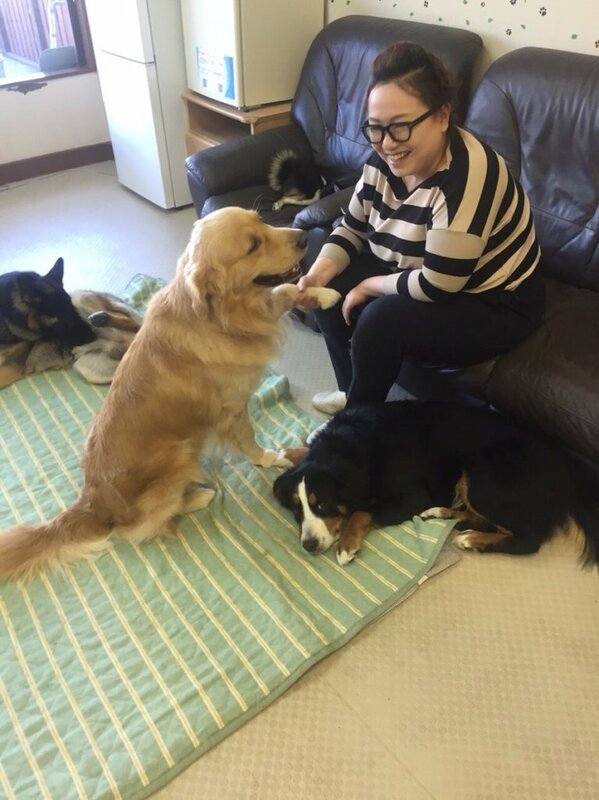 A year ago, a girl who was depressed for a certain time and disliked dogs visited the "Healing & Recreation Center for Human and Dogs" with her mother. Johann cuddled closely to the girl, giving her comfort and sense of security, and that gradually changed her. She began to go out on her own to meet Johann, and amount of medicine decreased and now she is able to go to work. We cannot underestimate the healing power of the dogs. For this power of the dogs to be acknowledged by more people, we will continue what we have been doing, with the animal therapy dogs. Thank you for your and understanding and cooperation.We really appreciate it! 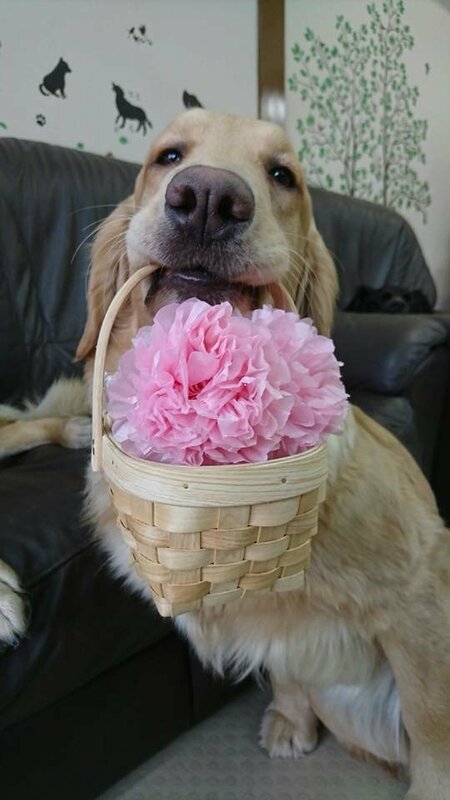 Hello, Thank you for your continuous support for our therapy dogs. Today I'd like to introduce the growth of Peace about his socializaion! 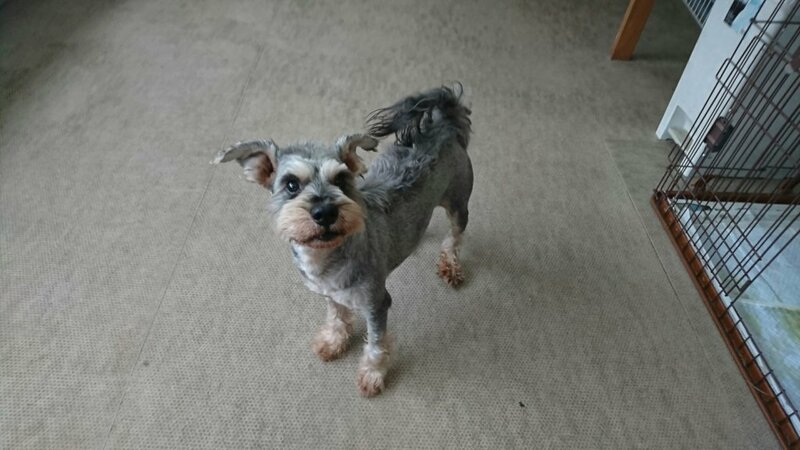 Peace is a boy, and the breed is miniature schnauzer. 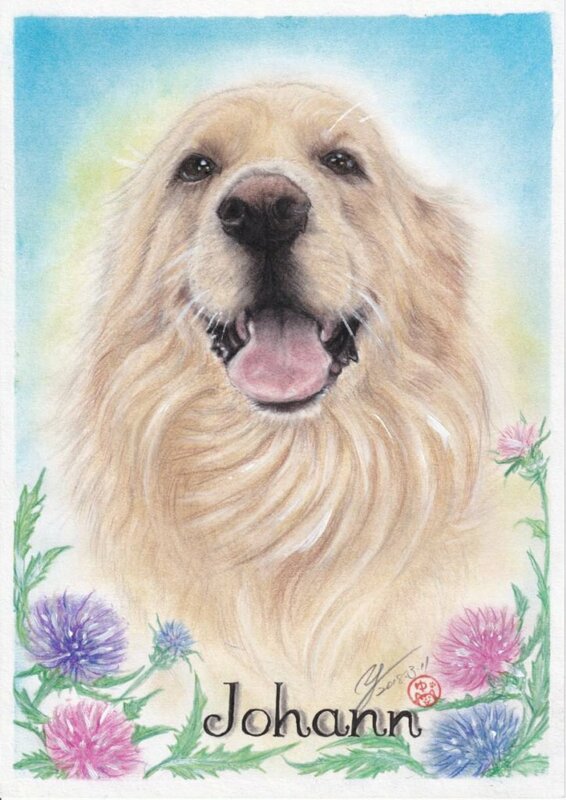 He was used to be a family dog, but the owner died suddenly and the owner lived alone, then Peace and the other dogs left in the house. They were lucky, and rescued before the worst story was occured. But he and his friends were too thin. If the discovery became a little bit later, it is not strang the all dogs died for hunger. They were really lucky. Anyway, now Peace is living peacefully in our association. But Peace had a big problem about the socialization; he didn't like the other male dogs! 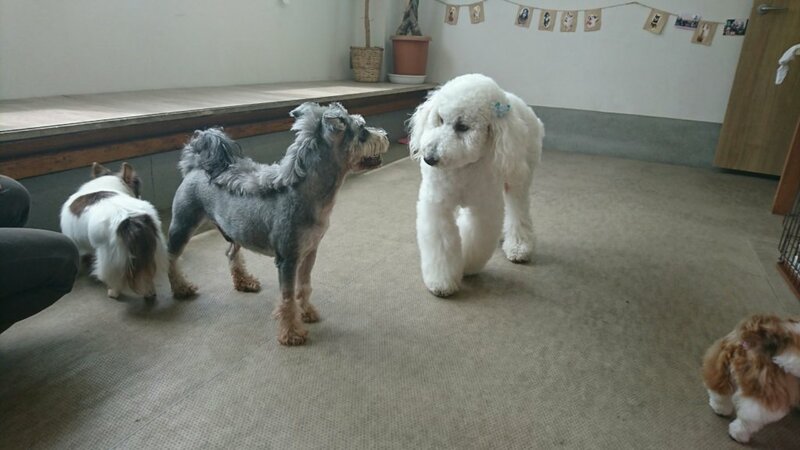 Peace is very friendly toward human, but once the other male dogs came to Peace, he got angry. He was not good at spending time and spaces with othe male dogs. This was a big problem to train him to a therapy dog. 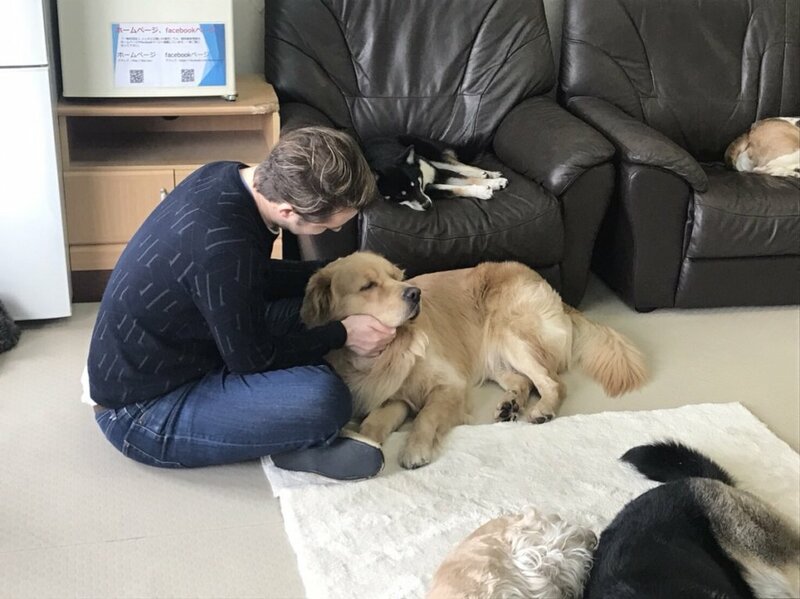 Then a little by little, our association' trainers gave him many experiences to spend with the other male dogs friendly. Of course the training should not be just a stress to Peace, then in the long term, we trained Peace socialized. Finally, now he never get angry to the other male dogs in the same space! It was very big progress for him. Also, it is very warm story but he loves puppies. 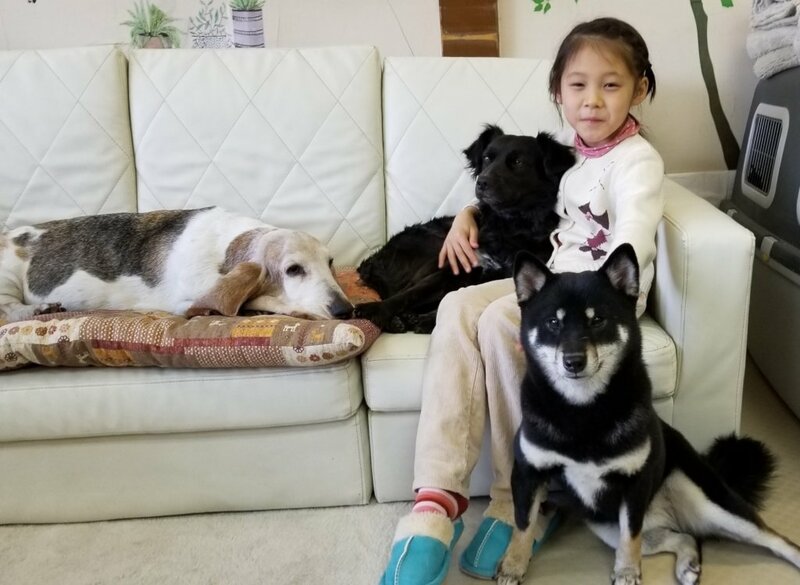 If there are puppies in the room, he is always with them, take care of them, and teach them many things, like he is their father :) When our staffs see the scenen, our hearts become so warm, and know how a kind dog Peace is. We think Peace is becoming a great therpy dog. 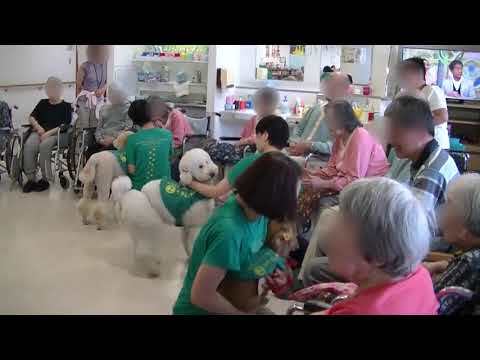 Hello, This is Japan Animal Therapy Assciation. Thank you for your support. Today I'd like to introduce one of our facilities, Mishima Training Ground. 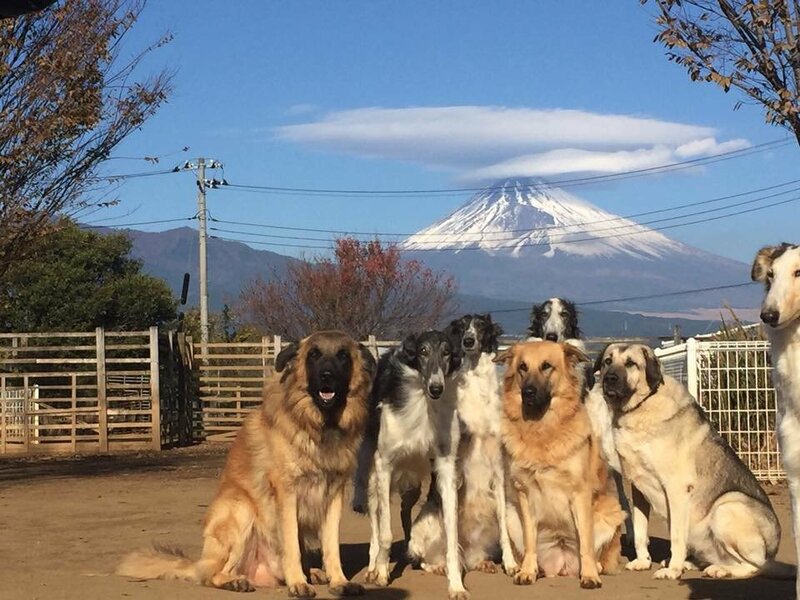 It is the place all the threrapy dogs to build their healthy body and relax. There is a huge ground and dogs can run their full with the dogs' friends. It is important for dogs' mental to keep healthy mentally and phisically. Also Mishima city has lots of green, nature, and the air is clear. It is very close to Mt.Fuji, the Japanese holy mountain. 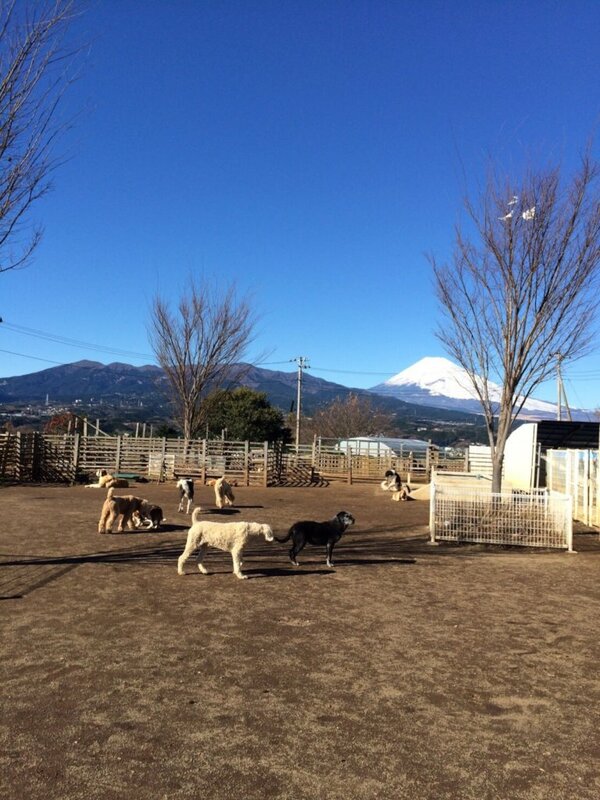 From our ground, if it is sunny day Mt. Fuji is always seen and it is so beautiful, like the attached pictures. We have several facilities in the differnt areas, Kanagawa prefecure and Misima city. Kanagawa is close to Tokyo, the central of Japan. It means there are lots people and the requests of therapy visits are very big number. 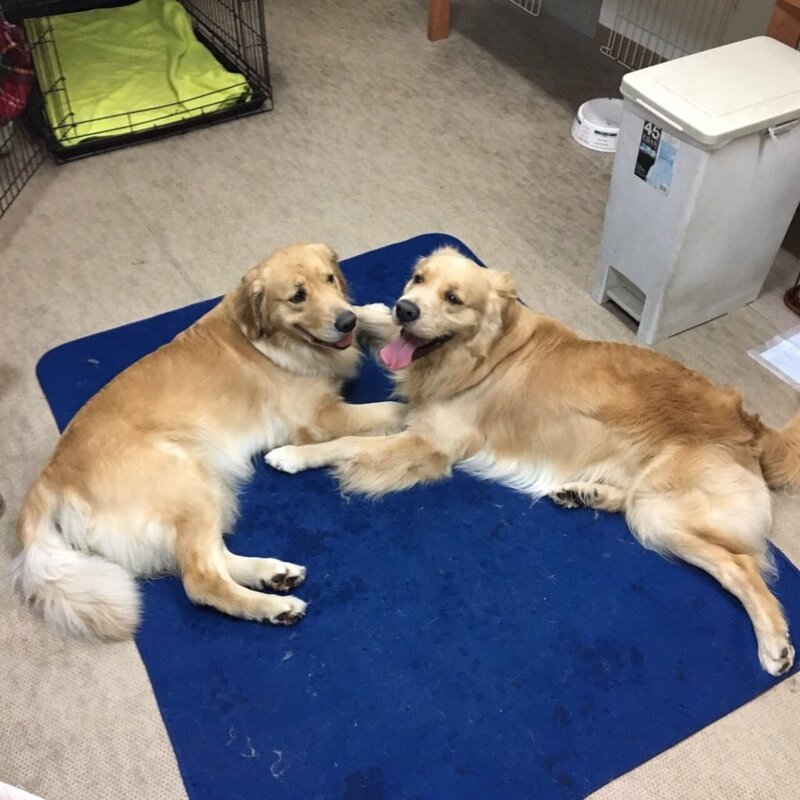 But we cannnot rent so large facility for the rent fee.Of course we let all dogs take enough rest, but we think it is necessary for dogs' health to enjoy running enough in the clean air environment without any therapy work. So we move dogs Kanagawa area to Mishima regularly in turn. It applies for our projects' dogs, like Johann, Chocolat and so on. Actually now Chocolat is living in Mishima Training Ground and enjoy her slow time. We hope all dogs enjoy the therapy works. 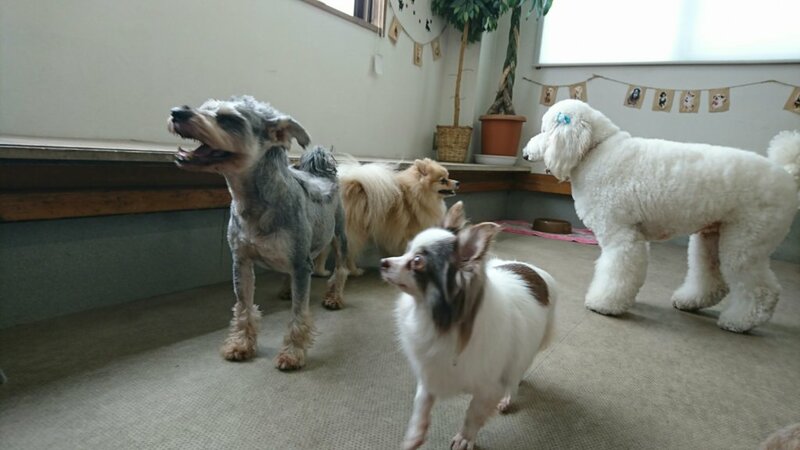 And to enjoy their work, it is necessary for dogs to take enough rest, and their mental is healty. It is the same as human. We can work hard because we take rest. Human and dogs are the same in many aspects. 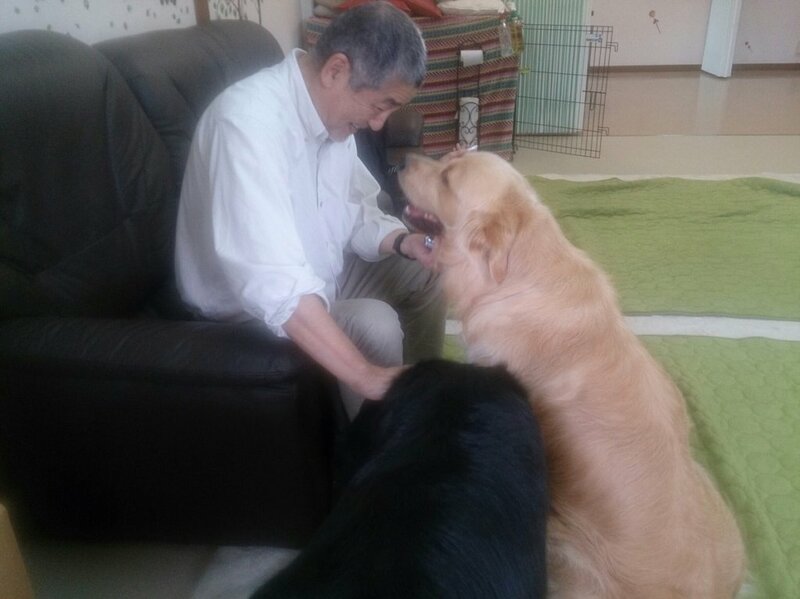 We will continue our therapy activities, taking care of the dogs' health as possible as we can. 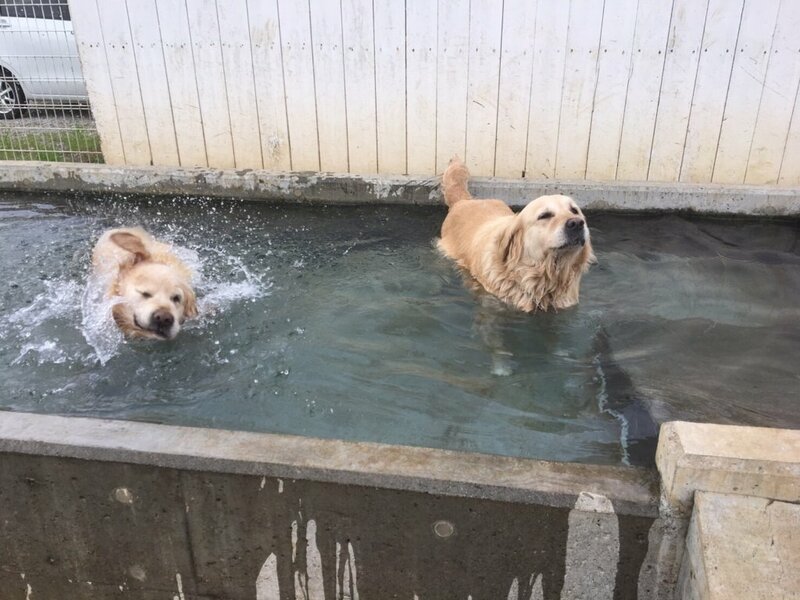 For Summer season, There is a pool for dogs. I'd like to introduce our 2 new projects! 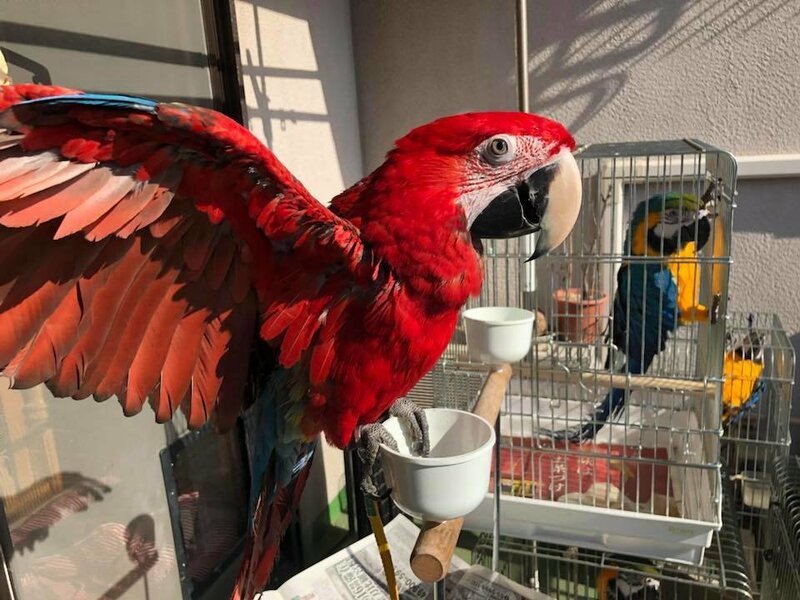 We started birds therapy, and as a trial we have already tried it, and the customers enjoyed with the time with sweet birds. We'd like to expand it, and offer much opportunity to interact with birds for more people. The funds in summer is a big problem for us, and alrealy and the hot day is increasing. In the middle of June, it will be very hot in Japan. Now GlobalGiving is doing a Mother's day campaign, and our association's topic is not associated with mother! But if you donate to our association. we would appreciate your help so much.